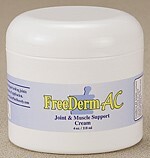 Freederm AC Joint & Muscle Support Cream: with its special blend of natural ingredients relieves pain symptoms within minutes of application. Has long term affects for keeping the joints lubricated while helping to rebuild damaged cartilage at the source. Thousands of satisfied customers of all ages from around the world. If you suffer from terrible joint or muscle aches and pains, and you want it to stop in the shortest time possible, so that you can experience comfort and freedom from pain, then the 'whole sale' pack is exactly what you need. SPECIAL: Because this is 'discount month', you can receive a huge 40% off the regular price, $100.00 saving! That's only $24.97 per jar (plus a small flat shipping fee of only $20.00 for the entire package, no matter where you live). Making this one of the easiest and least expensive ways for severe pain sufferers like you, to get life-long relief, almost instantly. Also the perfect gift for friends, family or colleagues, who may also suffer with pain.